Here are some more images from my last photoshoot with Mischkah. I was aiming for low key black and white, so used just one studio flash fitted with a strip softbox raised on a boom above and off to one side of the bed. 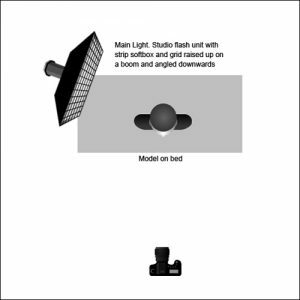 The softbox was fitted with a grid to control light spill and increase shadows and contrast. See lighting diagram below. I used my favourite lens, a 70-200 f/2.8 lens from several feet away. Mischkah was terrific in front of the camera, responding to direction or equally happy to improvise with her own poses. Click on each photo to see it bigger and feel free to leave a comment or question below. Thank you for reading.